A Grand Rapids man suffered internal injuries after he ran a stop sign at 14 Mile and Pine Island and was struck by another vehicle. Post photo by J. Reed. 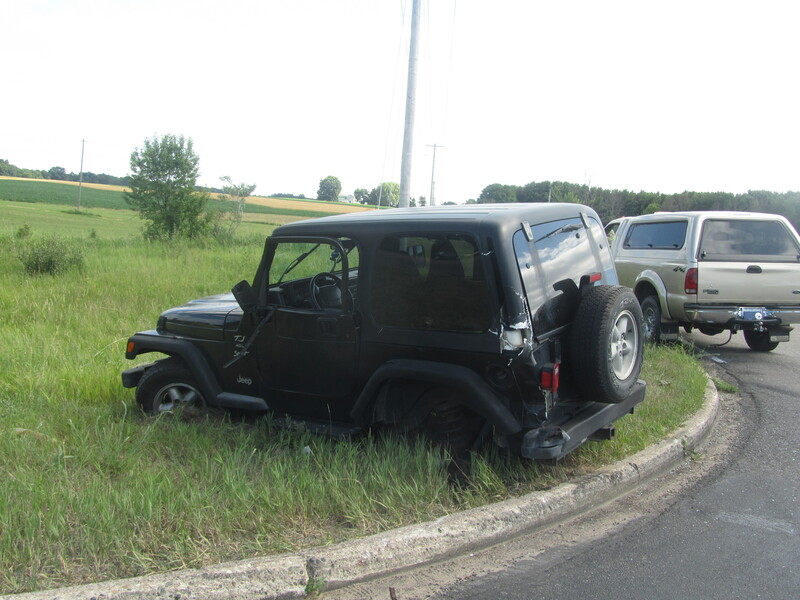 A Grand Rapids man was ejected from his jeep Tuesday after he failed to stop at a stop sign in Algoma Township and was t-boned by another vehicle. According to the Kent County Sheriff Department, the crash occurred about 4:20 p.m., Tuesday, July 5, at the intersection of 14 Mile Road and Pine Island. The 1999 jeep, driven by Randolph Galaszewski, 55, of Grand Rapids, was eastbound on 14 Mile and did not stop at the sign at Pine Island. He was then struck by a southbound 2000 Ford pickup driven by Matthew Wudkewych, 21, of Algoma Township. The impact of the crash caused the driver of the jeep to be ejected. He was transported to Butterworth Hospital by Rockford Ambulance and is being treated for internal injuries. Police reported he was not wearing a seatbelt. Neither the driver of the pickup nor his passenger, Hannah Krumenacker, 19, of Alpine Township, was injured. Police said alcohol is believed to be a factor in the crash, which is still under investigation. Algoma Fire and Rescue assisted at the scene.